2. Which is NOT a characteristic of a living organism? 4. An organism is any living thing. 5. 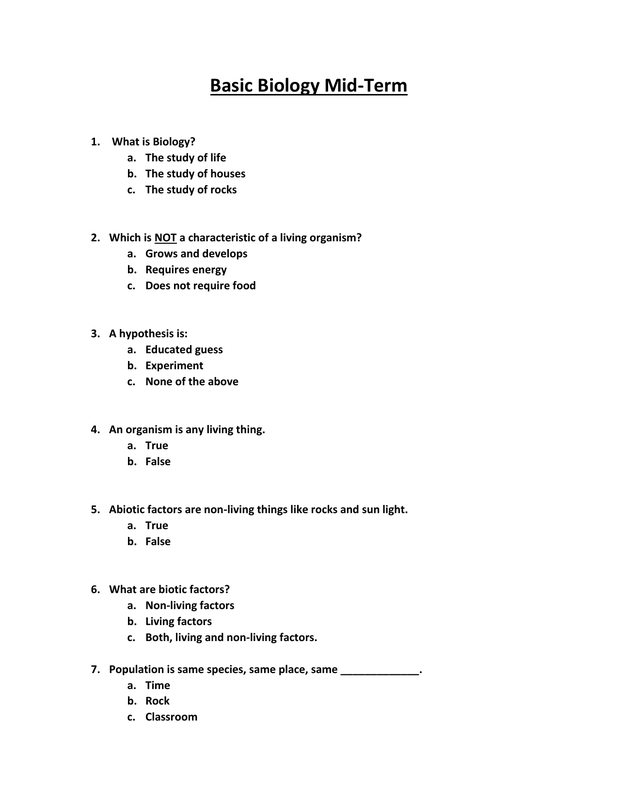 Abiotic factors are non-living things like rocks and sun light. 6. What are biotic factors? c. Both, living and non-living factors. 7. Population is same species, same place, same _____________. 8. All the living things in an area. 9. Ecosystem is all the living and nonliving things in an area. b. Organisms competing for food and mates. c. Animals running away from predators. 12. All plants are producers. 13. All animals are consumers. 15. Where does all energy on earth come from? 17. What is the correct term for plants releasing water from their leaves? 20. Which of the following is not an example of precipitation? 21. All organisms need carbon. 22. How does carbon cycle? 23. Cellular respiration is another word for breathing. 24. Producers use photosynthesis to create their own food. 25. What does this picture show? 26. Which living thing is a carnivore? 30. List 3 different species seen in this picture. 31. List 2 Abiotic (Non-living) factors in the picture. 32. List 3 Biotic (living) factors in the picture. 33. The eagle is the predator in the following picture.